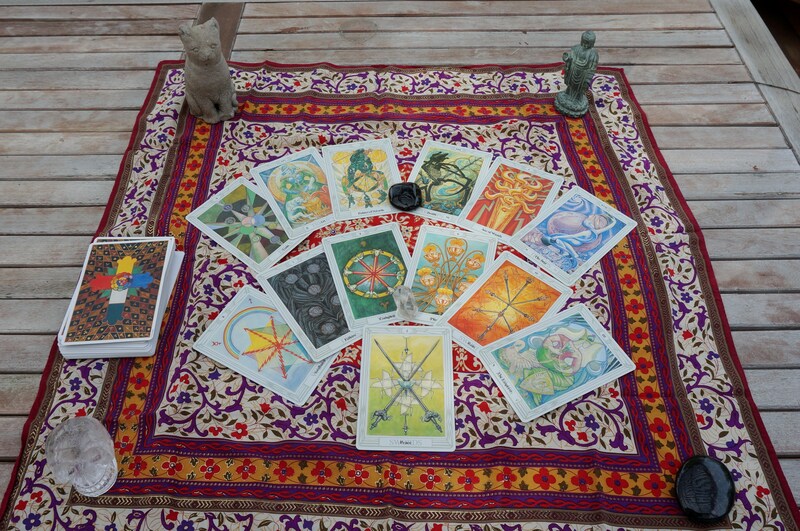 Aleister Crowley’s Thoth Tarot Deck for April 2013 Horoscopes. Don’t forget to check out the rest of ChristinethePsychic.com for upcoming events and classes. Want a private or small group class or consultation? Contact me at ChristinethePsychic@gmail.com for details. 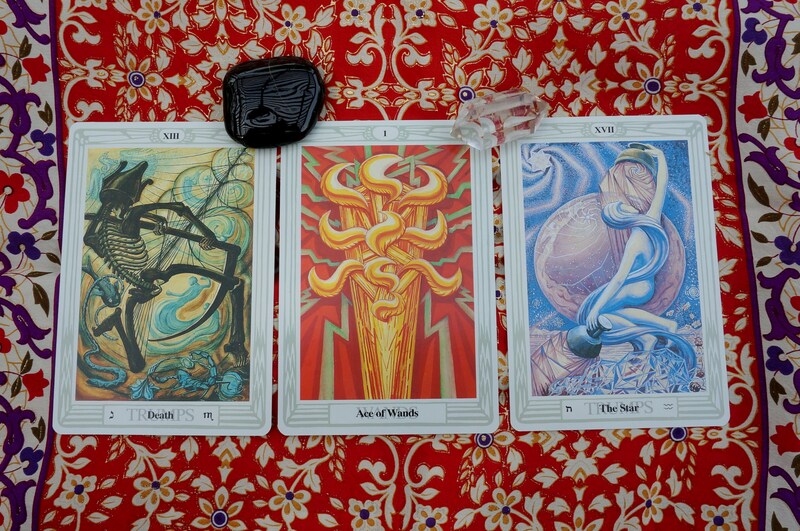 Note that some of the keywords included below are from Crowley’s Thoth Tarot. Many of these are falsely negative (or positive), so make sure to read your horoscope, even if it the keyword is strange. We’re all continually growing and moving to new levels. 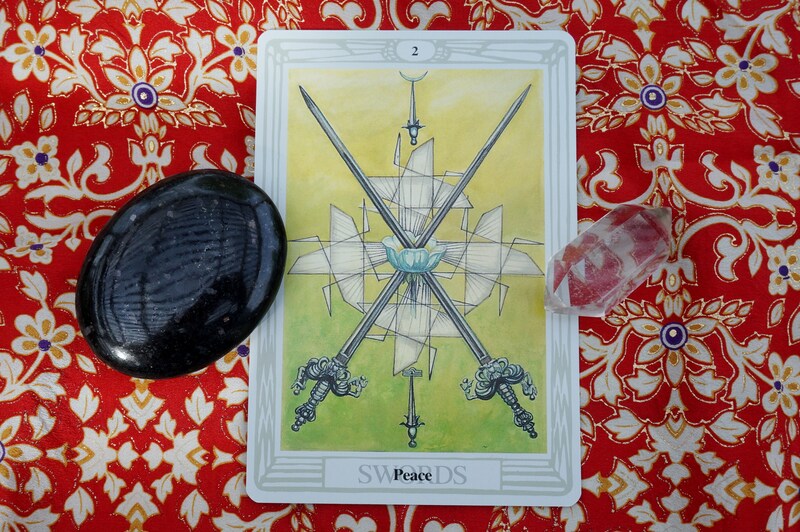 Card for Everyone: 2 of Swords, along with a piece of nuumite (left) and phantom quartz (right). Traditionally, this card represents a bit of a self-imposed stalemate. However, in Crowley’s deck the energy has shifted. We’re all at an intersection of life where everything is on “pause” and is hanging in the balance. Take April to enjoy the peace that has come, now that the last of the eclipses will occur in on April 4th. (It’s a total lunar eclipse. This is our first real break since October 2014.) Use this time to enjoy family and friends as life will be gearing up quickly in May. Make sure to get out and appreciate the sunshine! Aries, you’re moving into a time of completion. Your life feels a bit more settled, as everything is in perfect balance. The heavens above, the earth below, and nature all around will provide her gifts. At this time, be on the lookout for new beginnings. They will look almost irresistible and even may start to have a glimmer to them so that you’re put on notice, especially at the end of the month. Now is a nice time to rest and take in delight. You’ve been working hard. It’s time to start dreaming up your next chapter by the last third of the month. What will you bring to fruition using the Law of Attraction? Love? Money? A new home? It’s time to get started. Temperance embodies balance. In major arcana XIV – Art, Taurus, you are at the apex of balance and are expert at combining the light and dark within yourself. It’s time to integrate your everyday self and your shadow side to create something that’s more than the sum of those two halves. So, if you’ve been “too good” lately – it’s time to rebel a little. The opposite is also true—if you’ve been bit living in excess, Now is a time to find a meeting or support group, or even just a heart-to-heart with a dear friend. As you stir the cauldron of fire and ice, you’ll gain the strength of the lion and the perseverance of the phoenix. You will create anew from the bitter ashes of truth, which is your Art. Gemini, it’s time to let go of your burdens. Recently, you feel like you are doing everything for everyone, or that you’re the one who is helping others make progress. Instead, you’re neglected. Cut yourself free from the cords that you’re holding with an iron fist. You need to rebuild health and vitality. It’s time for you to start the healthy habits (maybe those you planned on at the New Year?). Now is also the time to make (and keep) any of those doctor’s appointments you’ve been putting off, so that you can continue on the track of preventive maintenance. But be kind to yourself, Gemini. Know that you’ve done what you can, but you can rework things for the better. Cancer, it’s a time of change and transformation for you this month. You have the power to end or break off what’s dragging you down—like old projects that aren’t important to you anymore. Without pruning away the old, you have no room for the new ascension and bliss made true through daily surprises. Be sure to cut the cords to negativity and negative people in your life. Both you and they will be better off without feeding that negativity. Give yourself a day off to look inward. What’s the next act? It may still be a little rough around the edges–but the payoff will be immense. Go for it! Leo, you are fire! While others are resting and taking stock of life issues, you need to dive in head first. It’s time to grab what you want. Your passion is divinely intended and fueled by Spirit. For example, if there’s a person you want to date, then it’s time to ask them out! Or maybe you want to train for a better job, or plan a dream vacation. 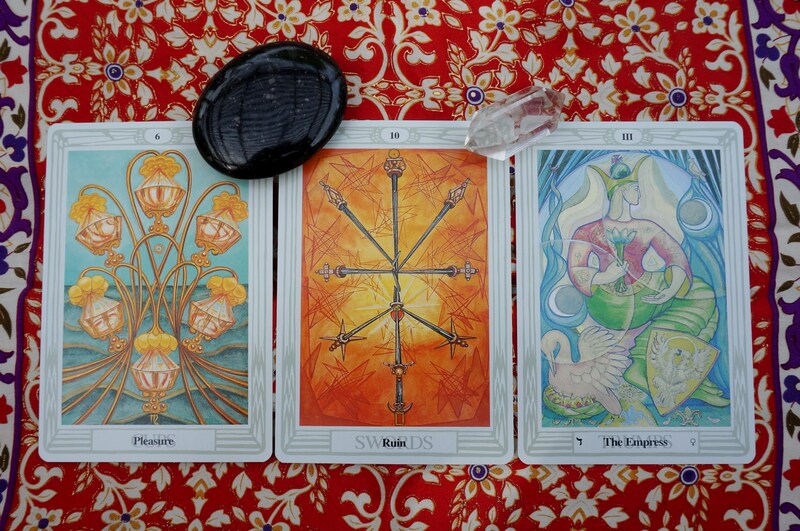 Harness your passions now, as it’s intended for you to get ahead while most of the other signs are resting and rejuvenating. This eclipse on April 4th calmed others down—but it’s just gotten you started! Inspiration is your key word for the month. Let yourself be inspired, by singing when you get up in the morning, taking walks in the moonlight, and appreciating what’s around you, whether that be the wonders of wildflowers—or a hot date sitting across from you at your favorite bar. It’s time for you to make the Star your own—to put your personal fingerprint on everything around you. How can you make your relationships and your environment more “you”? Know that you’ll be supported on this journey by Ascended Masters – people from the past who are here to help us in our daily lives. For you, this could be the Buddha, St Germaine, or even a long lost Aunt. Now is the time to ask them for help, more often, and for more than you think you need or deserve. You are loved, Virgo. These Ascended Masters will lead you and help you find inspiration. Libra, things are moving so quickly that it might even feel like you’re buzzing on 20 cups of coffee. You’re not quite sure which direction to go, because all directions seem equally appealing. Before you take off onto big new things, sit and meditate on what will bring you the most happiness or joy, if you only had one big dream come true for the rest of the year. (Not that you can’t have more dreams—it’s just time to work on this one first. Prioritize, Libra.) The rainbow in tarot often signifies the romantic love of a happy ending. It’s also a promise that there will always be a new dawn after a storm. Surround yourself with family—whether they are blood relative or your family of choice, they will help you move forward, especially if you want a new job or home. So, Crowley’s vision is failure, while Rider-Waite-Smith sees this card as the farmer. Embrace failure as your fear about the situation, and let it go. Remember yourself as the farmer who has sowed the seed and has been rewarded with a beautiful, flourishing crop due to their care and diligence. This is not a time to be careless, Scorpio, as you’re not quite done. The energy of the 7 as expressed by the Thoth is yearning for the regenerative power of infinity which is found in the 8, just one card away. You’ve done a fantastic work but you’re probably going to have to push for another 6 to 8 weeks for things to begin to settle in with the best results. Know that Spirit has acknowledged the hard work you’ve put in, that’s coming to fruition. This is a time of completion and rest for you, Sagittarius. Out in the Spring sunshine, it’s time for you to come to a new level of trust and self-care. Use April to balance your masculine and feminine energies. Let go of the need to control that which is around you, and begin to use Byron Katie’s questions instead, “Is it true? Is it really true?” This message is a reminder of your recent cycle of completion (ending in early April). But, you can also feel the energies around you, simmering under the surface, ready to burst. Your relationship or dating life is ready for renewal, if you can back off and just enjoy the process and let go of the outcome. Take another chance on love, especially if you’ve been shunting it aside due to seemingly more important projects. Love can change your whole life. Capricorn, your pleasures are interesting in so many ways. Find those connections in the community around you. Define joys in the everyday. Note that you are fighting some big payoffs, becuase they seem hidden to you. There are a succession of gifts waiting. They are golden lotus flowers that bathe you in Divine light. Appreciate the moment, stringing cherished memories like pearls on a string, each secured with its own knot. Fit in as much joy and fun as possible. You may be tired, but if somebody asks you to go out, get out of the house and bathe in that golden light. The number 10 can often be seen as “too much.” So when Crowley uses the keyword “ruin,” it’s a reminder to not overthink the irrelevant. Avoid histrionics and the overdramatic. Ground yourself, and take a little vacation from living in your head, Aquarius. Instead of stressing out about the taxes, put one foot in front of the other and find another path. This may be a bit of a challenge, because this is a month of passion for you. As your emotions might feel little out of control or off, do what you can to take care of yourself. You’re going to be onto better things next month. Know that you’ve been capable and confident in the past, and that you will be again. The Empress is the great Mother. This means that you need to take on the transmission of knowledge. Who are you a parent or mentor to right now? Who is a mentor to you? If these relationships are not clear, it’s time to seek them out. 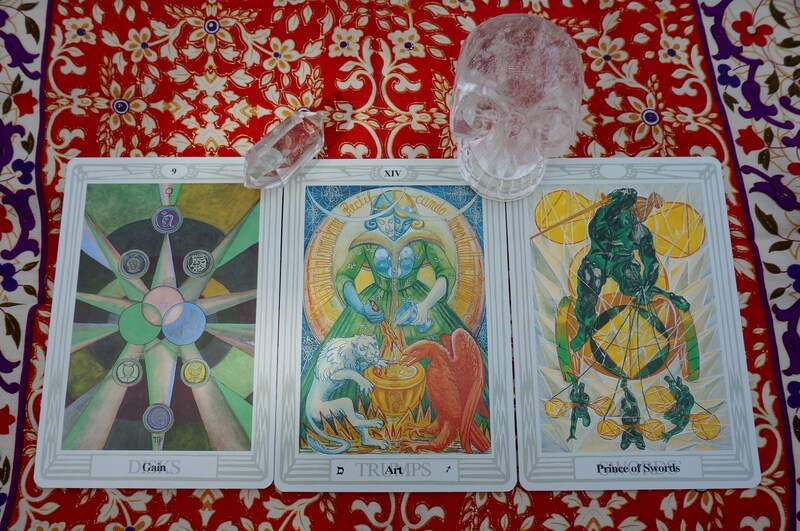 You’re ready for another alignment, where you will combine vigor with discernment. At this spring holiday, take a moment to listen and value the stories of the elders in your family. These stories will straighten out some issue for you. This month, by mentoring and being mentored, you are of service in so many ways. Connect the generations through your presence and loving guidance. 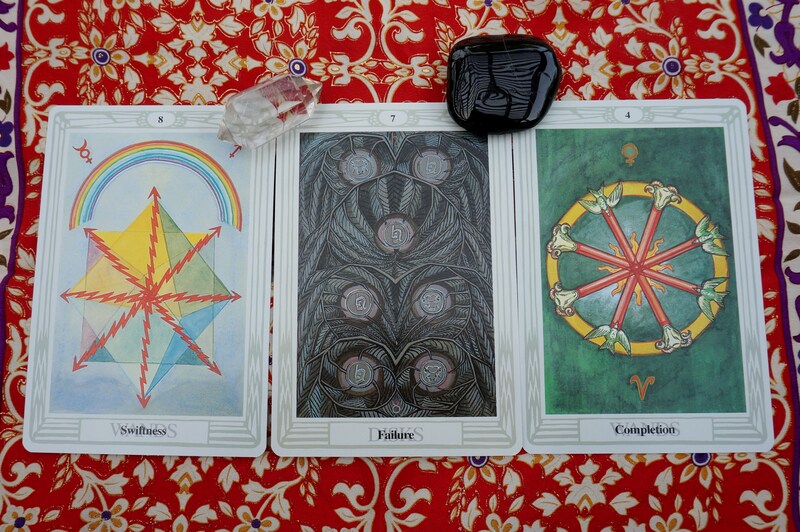 This entry was posted in Tarot/Horoscope and tagged Austin, Christine Linial, horoscope, medium, oracle, psychic, tarot, tarot class on April 1, 2015 by christinethepsychic.